We’ve spent a lot of time talking about Sandy’s storm surge but the wind associated with Sandy along the Connecticut shoreline was quite impressive. In fact, the recorded wind gusts were some of the more impressive wind gusts I’ve ever seen at the official ASOS stations on the coast here in Connecticut. When factoring in the duration (i.e. not a quick hitting thunderstorm) and how widespread the 60 knot gusts were (i.e. not in just one corner of the shoreline) this is probably the strongest wind storm on the Connecticut coast since Hurricane Gloria in 1985. 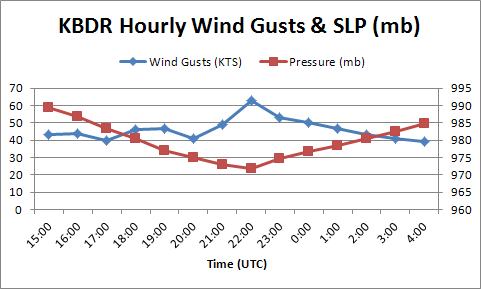 The peak gust of 66 knots at BDR was recorded at 21:03 UTC and the lowest pressure was recorded at 22:02 UTC with 971.9 mb. This graph of wind and pressure is what you’d expect for a hurricane passing near (but not over) a certain area. Hurricanes have a tight radius of strong winds near the center of the storm with lower wind velocities the farther one goes from the storm’s center. While Sandy was a hybrid storm it did maintain an inner core through landfall that contained the strongest winds. If you look at the RUC proximity soundings around the time of lowest pressure at BDR you can see some interesting things. I’ve attached the BUFKIT soundings from the surface through 800mb at Sikorsky Airport at 18z, 21z, and 00z. Note the time listed is standard time and not daylight saving time. The top sounding form 00z shows a very shallow mixed boundary layer. The mixing depth is only around 700 feet with a wind velocity of 59 knots at 700 ft AGL. Not surprisingly, the hourly gust at BDR was 46 knots. By 21z the mixing depth was similar but the wind field was a bit stronger. At 21z maximum wind gust was 49 knots but by 21:03 UTC a peak gust of 66 knots was recorded! While the RUC sounding only shows a 64 knot wind at the top of the shallow mixed layer by 22 UTC (not shown) the wind at that level increased to 74 knots. It’s possible the RUC analysis missed the northern extent of the stronger wind field at 21 UTC. In addition, the boundary layer was in the process of drying out and warming up. Between 20:52 UTC and 21:42 UTC the temperature spiked from 16ºC to 18ºC which means the mixing depth may have been a bit deeper than 700 feet. By 00 UTC, there’s no question the mixed layer is deeper up to 1900 ft AGL with 77 knot winds there. Impressive. Below is the first SPECI with the 66 knot gust. There were also several 63 knot wind gusts at BDR at 22:01 UTC, 22:31 UTC, and 23:19 UTC. The 00z OKX sounding shows the same thing with a raging jet just off the deck and a mixed boundary layer into a portion of that stronger jet (69 knots at 445m AGL). As mentioned in my Sandy summary blog post we’re lucky that the soil was dry and the trees were mainly bare. Had winds like this occurred a month earlier the wind damage to trees would have been exceptionally more impressive than what we saw. After the wind died down Tuesday morning Connecticut Light and Power had just shy of 500,000 customers without power. 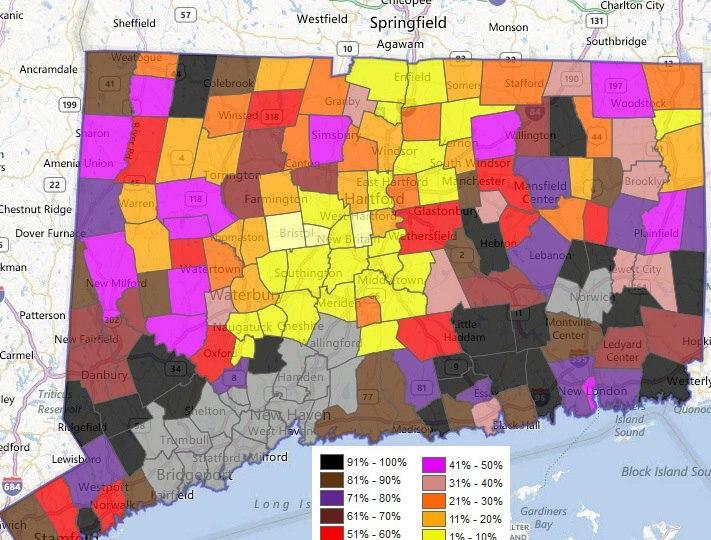 Not surprisingly, the highest number of outages were along the shoreline and in the more rural parts of Connecticut. Areas with elevation in the northwest and northeast hills saw somewhat higher winds than the Connecticut River valley. These outages would put Sandy on par with Gloria for number of outages and behind Irene and the October snowstorm (which holds the record of 803,000). There’s no question this storm produced an impressive and powerful several hour burst of damaging wind shortly after nightfall across the state. Getting several hours of 60+ knot wind gusts at various reporting sites in the state is impressive. I can’t recall a storm since Gloria being able to do it here in the state. Should be a pretty solid storm on Wednesday across New England. Our computer models are showing the potential for gusty winds (up to 50mph) and 1″-2″ of rain. The wind and rain should occur over a short duration on Wednesday but will likely be impressive. Temperatures will approach the 60 degree mark as well with a screaming southerly wind transporting wind and moisture north. It’s possible a few thunderstorms could develop but at this point it doesn’t appear storms will be widespread. If they do develop, however, some could be severe. 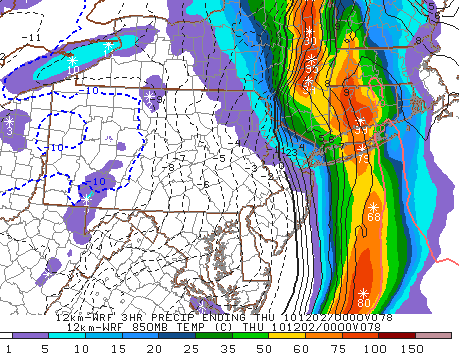 Here’s the 18z NAM precipitation forecast from 4 p.m. to 7 p.m. Wednesday which shows nearly an inch of rain over parts of Connecticut in a 3 hour period – that’s impressive! This is the NAM surface temperature forecast for midday Tuesday. The yellow is temperatures above 60 degrees! The average high on Tuesday is 48 degrees in Hartford so if the 62º-64º forecast is accurate we’d be looking at substantially warmer than normal temperatures across Connecticut. Up north the NAM is showing 60s for ski country in southern Vermont – even in the higher elevations! The warmth won’t last long. It’s back to normal by Wednesday afternoon along with a ripping northwesterly wind. The Thanksgiving storm (now delayed until Thursday night and Friday) could still produce a little bit of snow and sleet in southern New England with the potential for a more sizable winter storm (including ice) in Vermont and New Hampshire. Winds are gusting between 25 and 40 mph across the state currently as a storm pulls north of New England. 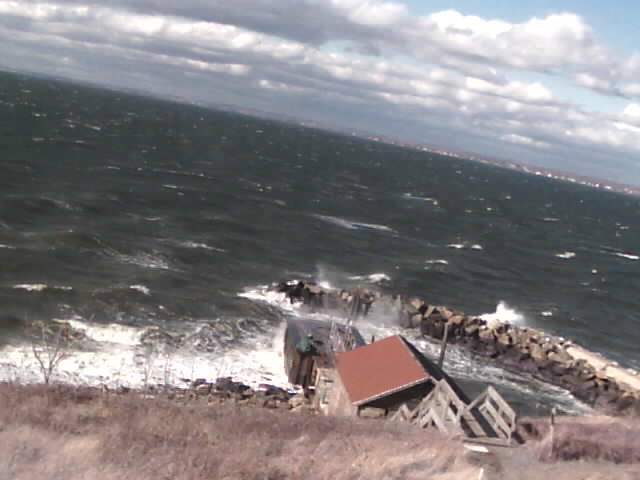 On Long Island Sound winds are gusting to near 45 mph and whipping up the seas now to 4 feet at the central Sound buoy. This is a picture sent to me from one of the guys working on restoring the Faulkner’s Island lighthouse about 5 miles or so south of Guilford.